2% will receive life-saving defibrillation before the ambulance arrives. 40% will receive bystander CPR (cardio-pulmonary resuscitation). 50% do not receive resuscitation from ambulance crews because they are already dead. 10% of victims survive to be discharged from hospital. 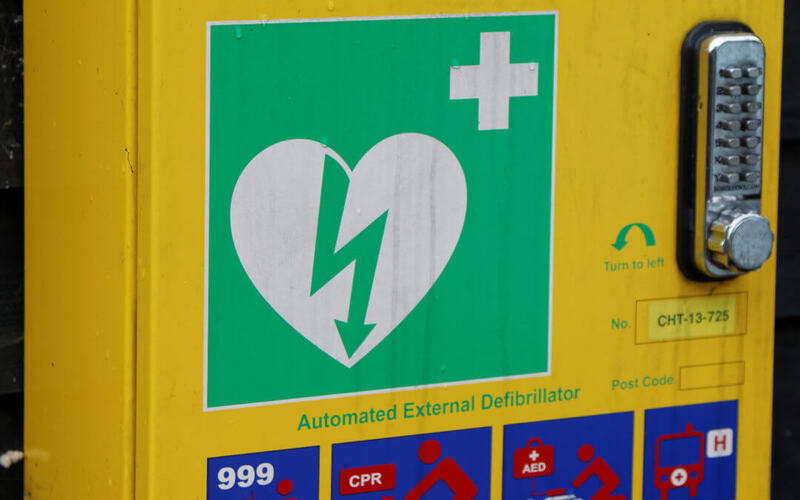 One way to reduce the amount of deaths and increase the survival rate of people having a cardiac arrest is to have more defibrillators (AEDs) available in the community. However, it is not just enough to have these available, the public need to know how to use them and perform CPR until the device arrives. If you are not confident doing this, you should attend a course to learn how. Dr Lifson will be running a FREE AED/CPR course at Springfield House in Stirling again soon. Details will follow. There are many useful videos at the British Heart Foundation website to learn how to perform CPR. HeartSafe is the UK’s leading public defibrillator website, which means you can locate your nearest AED device and help save a life. If you have an AED device at your work, sports club or business, you can register it at the HeartSafe website to make the public aware of the location. When someone has a cardiac arrest the minutes before help (ambulance) arrives can be crucial to the survival of the patient. If there is a defibrillator (AED) available, you need to use it. You don’t have to be trained to use the AED, the device will tell you if the patient needs to be shocked. First, make sure someone has called for an ambulance, and, if an AED isn’t immediately available, give CPR (cardiopulmonary resuscitation) until someone can bring you an AED. As soon as you’ve got an AED, switch it on. It will immediately start to give you a series of visual and verbal prompts informing you of what you need to do. Follow these prompts until the ambulance arrives or someone with more experience than you take over. Once you’ve done this, the AED will start checking the heart rhythm. Make sure that no-one is touching the person. Continue to follow the voice and/or visual prompts that the machine gives you until help arrives. Due to Dr Lifson’s experience and background in cardiology, with research and publications regarding to the urgent short-term treatment of heart attacks, he is extremely passionate about heart health. With an active voice in the local community about the availability of defibrillators (AED), particularly in rural areas, he is dedicated to his patients having healthy hearts. As part of his civic duty and passion for healthy hearts, Dr Lifson will provide all patients attending the clinic (for any consultation) over the age of 50 will be screened for AF (atrial fibrillation) using the Alivecor technology for FREE. 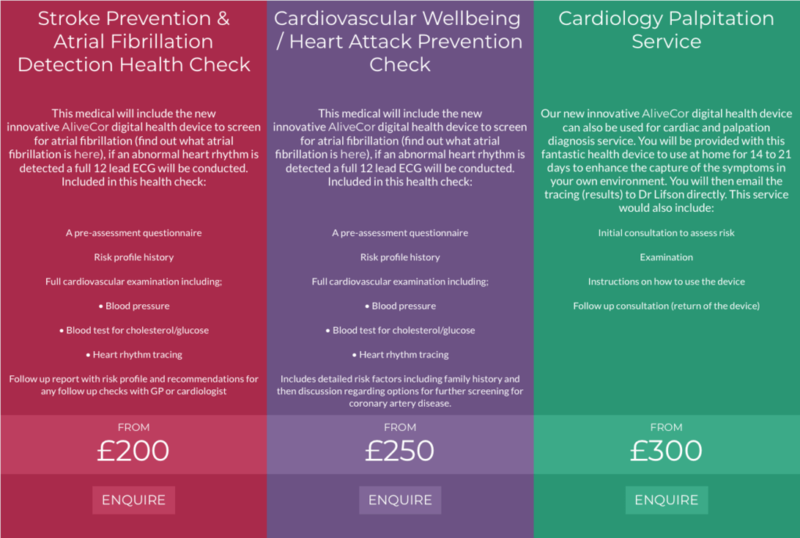 If abnormal results are recorded the patient will be offered an ECG at the clinic (an £75 ECG fee will be charged for this) or the patient will be referred to their own NHS GP for an ECG. The patient will have an email report/tracing from Alivecor provided by the clinic to take to their NHS GP. Book your appointment today by clicking here.